Matthew Stevens said a happier personal life has helped him return to form and was a factor in his first-round win over fellow Welshman Mark Williams. Stevens, 37, held a 7-2 overnight lead over two-time winner Williams and took the first three frames to close out a 10-2 victory. "I feel comfortable and good in myself which I haven't done for a number of years," he told BBC Radio Wales. "I am a lot happier in my personal life and that helps." The world number 35, who faces Ronnie O'Sullivan in the second round, was declared bankrupt earlier this year and has had other problems away from the table. But Stevens, who had to win three matches to qualify for the Crucible, said he was feeling good and was now reaping the rewards of putting in more hours on the practice table. "I thought I played pretty solid," Stevens added. "It wasn't fireworks but it was a lot better than I have been playing. "There were one or two crucial frames which I managed to pinch and 7-2 overnight was a bit of a false score really, but I will take that and I managed to finish it off well." Stevens, who scored a high-quality 115 to win the first frame of the second session and finished off with a 73 clearance, admitted facing his long-time friend - the world number 14 - made the match all the harder. "It's never nice playing Mark," Stevens said. "We grew up together, played in all the junior events together and have known each other for 28 years. But you have to go out there and do a job." Williams, 40, described his own performance as "terrible". "I did lose about five or six games on the blue, pink and black so the score-line could have been a lot closer," he said. "But I wasn't very good at all. "Every game was close. I just kept missing balls and leaving them on the hole. It was 7-2 at the interval and could have been 5-4 either way. "That's how it goes and you have to get on with it. But he will have to play a lot better to beat O'Sullivan." 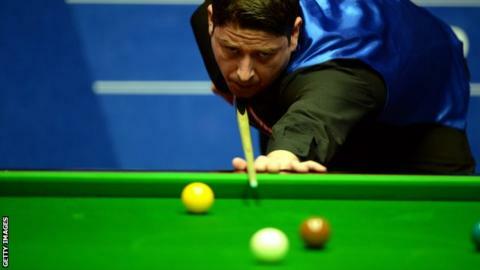 Stevens accepted he will need to be on top form to beat the five-time world champion when they meet in the next round. "I am obviously a massive underdog, which I don't mind," Stevens said. "I wasn't expected to win against Mark. "I will enjoy the game and if I lose I lose, but I am not afraid of Ronnie. I will play my game and give it my best shot."